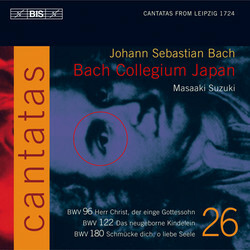 The 26th Volume of Bach Cantatas with Masaaki Suzuki and Bach Collegium Japan consists of three works composed for performances during the last three months of 1742. They are part of the composer’s projected (but discontinued) Chorale Cantata Year, in which every cantata for a whole year was to be based on a well-known chorale rather than on the traditional gospel reading for the Sunday in question. The text of the chosen hymn was thus reworked by the librettist into poems suitable for setting into recitatives, arias, duets etc. Of the three works in question, BWV 180 (Schmücke dich, o liebe Seele) is the most famous. Based on a communion hymn by Johannes Crüger, its opening chorus has long been regarded by Bach connoisseurs as one of the most beautiful in any of the cantatas. (‘One can tell from the composition that the master was working on one of his favourite melodies’, wrote Albert Schweitzer.) BWV 122 (Das neugeborne Kindelein) was intended for the Sunday after Christmas, which in 1742 was also New Year’s Eve, and is a meditation on the future, seen in the light of the recent birth of the Saviour. The BIS Cantata Cycle has recently been earning even more praise than usual. In the 2004 best-of-lists of the critics of the German magazine Fono Forum, the whole series was put forward as Edition des Jahres, and Volume 24 was named Choc de l’année in the influential French review Le Monde de la musique, while Diapason gave it their November Diapason d’Or. In the same month Volume 25 was chosen as Disc of the Month by BBC Music Magazine, while in the December issue the Gramophone critic wrote: ‘Suzuki projects the unity of each work with carefully sculpted opening choruses, well-leavened recitatives and urgent, radiant orchestral playing… a recording series, reaching near its mid-point, of outstanding consistency.’ This the 26th volume will surely be seen as a worthy successor!